Addressing an election rally in Silchar in southern Assam, Mr Modi said that the mood in the country could be guessed by crowds in his rallies. Kendukona (Assam): Prime Minister Narendra Modi on Thursday said that black money is rolling out of Congress leaders’ house as a ‘new scam’ —“Tughlaq Road Chunav Ghotala” — of Congress party had come to light. Claiming that crores of rupees which was meant for nutrition of children and expectant mother had been seized, Mr Modi said, “The naamdar parivar (famed family) is engaged in corruption and has made it a way of life for which its members are now on bail, but they call the chowkidar a chor. He also said Congress compromised with the nation’s security by demanding proof of the attack on Pakistani terrorist camps. Asserting that Congress, while indulging in vote-bank politics, ignored crucial issues afflicting the Northeastern states, Mr Modi said that there was ample opportunity for the Congress, after 1971 Indo-Pak war, to settle the problems of Assam and Jammu and Kashmir but it kept the issues burning deliber-ately for its vested interests. “The Congress encouraged infiltration to ensure that its vote bank remained intact. But this chowkidar will ensure that infiltration is stopped to protect the interests of the people of Assam and Northeast... To protect Assam’s interest and integrity we have taken concrete steps. We carried out a land boundary agreement with Bangladesh following which fencing the border became possible. The process is on to identify those who infiltrated; soon the work will be completed. We are ensuring that no genuine Indian citizen is left out and no infiltrator’s name is there in the National Register of Citizens (NRC),” said the Prime Minister. He also said that his government was also working to protect the identity of indigenous people by taking steps to implement the clause 6 of the Assam Accord. Clause 6 provides for constitutional, legislative and administrative safeguards to protect the cultural, social, linguistic identity and heritage of the Assamese people. “We are also working to grant Scheduled Tribe-status to six communities. A bill was tabled in the Rajya Sabha in this regard,” the Prime Minister said while clarifying that the BJP will also ensure that rights and privileges of existing tribes are protected. After addressing the public rally at Kendukona where voters of Guwahati and Mangaladoi Lok Sabha seats had gathered, the Prime Minister addressed another rally at Silchar in which he appealed for votes for the BJP candidates from Silchar and Karimganj seats. “There is a strong wave in favour of us,” he said. “The people of India have made up their mind. The Opposition has no way out. Five seats are going to the polls in Assam. The NDA will be victorious in all five. These elections will decide which direction will India move,” he said. 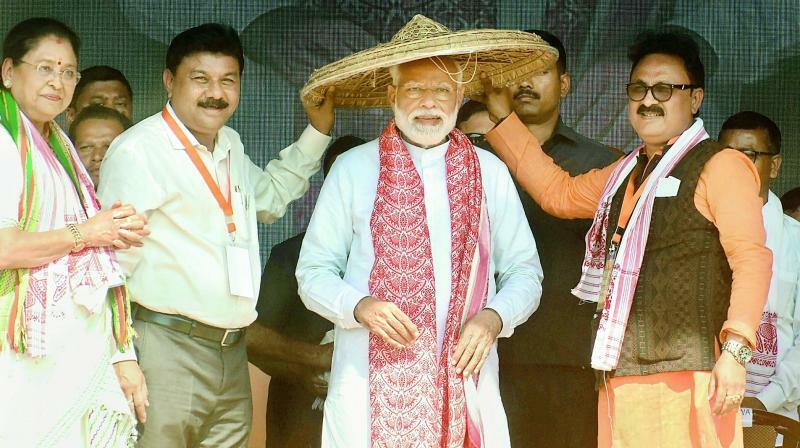 “We are committed to bringing Citizenship (Amendment) Bill after consultations with all sections; it will be amended in a way so as not to impact Assamese people,” Mr Modi said.